In looking into my Fathers side of our family history, it was established that my grandfather, George Parkins, moved his family, wife and five children, from Bedford to Aspley Guise to work at the Powage Press. At the start of this study, the date of this move was not known to within a year or so. However, as more information was gathered in, it became clear that it was near to the time of the fire which burnt down the Powage Press in 1911. Such a catastrophic event would have had a profound effect on our family history. This lead to a closer identification of the dates, to establish whether Grandfather moved before the fire and suffered the extreme worry of instantly losing his livelihood having only recently uprooted his family from Bedford, or, was he recruited after the fire to join the new organisation which arose from the disaster. All of this led to a more detailed study of the fire itself, and particularly the consequential events, which had a considerable influence on the community of Aspley Guise. This account of the fire and its aftermath is produced separately from the family history, although some brief references thereto are included. It marks 100 years from the original event. 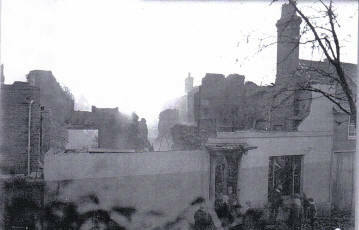 On the morning of Tuesday 12 December 1911, the Powage Press printing works was completely burnt down. This news was extensively reported in the next issue of the Beds Times published on Friday 15 December 1911. It is thought that the fire started about midnight on 11-12 December 1911 and rapidly spread in the early hours of the morning. Many local people and employees turned out to help fight the fire. These included Arthur Morris from Ridgmont who held some managerial post. Since he lived fairly close by, it is likely, but not certain that Grandfather George Parkins was also in this group of helpers. It is suggested in the Press report that a spark from one of the fires may have been a contributory cause. If this were so, then the building must have used open fires for heating. Moreover, it being well into December, they may have been well stoked up. Figure 4, views 3, 4, 5 and 6 of the destroyed factory show a wall with apertures which could be fireplaces at a height which would appear to be the second floor. Originally, the two story buildings were part of the Aspley Academy, (Figures 1 & 2.) They were converted into a Printing works in 1875, by Mr John Kemp with, presumably the machinery on the ground floor, and the offices and possibly the composing activities on the second floor. Figure 3 shows the front of the original building. The fire may have been initiated by sparks from the second floor open fires – an area which was in earlier times the dormitory for the pupils of the Academy. A further source arose from the wooden beams supporting the second floor being built into the chimney stacks and the fire spreading into them. This would cause the first floor ceiling to collapse bringing everything down on to the machines on the ground floor. The roof would also have been destroyed. Hence Figs. 4, 5 and 6 show the machines covered with debris including charred wooden beams with only some brick walls still standing. Fenny Stratford Fire engine attended most of the day of the 12th December 1911. Also, a member of Bletchley UDC, Mr. Hedley Joseph Clarke, attended the scene. The fire appliance comprised a steam powered pump, drawn by horses. The horses were those used to pull the Council Dust Cart. The men were all volunteers. (It is interesting to speculate on the likely time taken for the Brigade to arrive at the scene of the fire. Firstly the alarm had to be conveyed from Aspley Guise to Fenny Stratford, by telephone, or horse borne messenger, probably in the early hours of the morning in darkness. The horses had to be gathered in, harnessed up for the journey to Aspley Guise over the poorer quality roads of the time. This alone would take about an hour. It was the practice to light the fire in the boiler, and raise steam during the journey so that it was all ready to go on arrival. From initial alarm to arrival on scene could well total 2 hours.) Nonetheless, the entire office and workshops of the Printing works were destroyed, – a much more severe outcome than a fire of two years previously which only affected the office section. 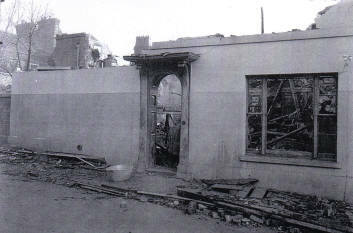 There are several views of the destroyed buildings, and one also shows the roof and chimneys of Guise House in the left rear. There is no sign of the fire engine or its equipment in any photo, which suggests that they had left the scene. The pictures are taken in full daylight, necessary for outdoor photography in 1911, but a relatively short part of the day in December. Shadows from the sunlight appear in some pictures. This combines to suggest that they were taken at around midday, probably on the next day 13 December 1911. 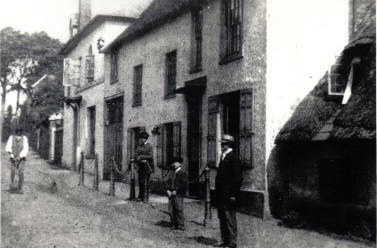 This is a phot intended to show the cottage on the right and Chain House in the centre. It also shows the front of the original Powage Press building on the left, further up the road. Bletchley UDC routinely met on Tuesday the 12th December 1911 in the evening of the day of the fire (copy of minutes attached) and received a favourable report on the performance of their fire service from Mr. Clarke. The Clerk reminded the Council that Aspley Guise was outside the ordinary area of operation of the Brigade (over the county boundary!). Nonetheless it was proposed that, in view of the seriousness of the outbreak, that the response should be approved. Not all members agreed. An amendment was moved that the matter be adjourned until the next meeting. However, 4 members supported the amendment, and 6 voted for the original proposition. Hence the turnout was approved by a vote of 6:4. This meeting of Bletchley UDC was reported in the Beds Times of 15 December 1911. This same issue included an extensive account of the fire. It refers to “yeomen service” rendered by Fenny Stratford Fire Brigade, several police constables led by a Supt Harlow, and many members of the local community Also Mr Charles Minter, Powage Press Manager and Company Secretary and his sons were present. This report quotes the damage at £20,000. Figs. 4, 5 & 6. photographs of the burnt out buildings. The almost complete devastation is evident. Mr John Kemp, owner of the Powage Press, was living in Torquay at the time. He received a telegram on the morning of the 12th December whilst he was having breakfast, which stated, with blunt economy of words, “Powage Press burnt to the ground”. The effect on his digestion is not known. A special meeting of Aspley Guise Parish Council was held on 18 December 1911, only 6 days after the fire (a copy of the minutes thereof is attached). They set up a relief fund to help those rendered unemployed by the Powage fire, and a committee was formed to manage the fund. All employees were paid up to the end of the week of the fire, 16 December 1911, and some, but not all, were kept on after that date. Some were employed clearing the site. Some clerical work was continued in a Villa in Mentone Avenue. Printing was done in London. Also at this meeting of the Council on the 18th December 1911, Mr Wilkinson read a lengthy report by Dr. Fowler on discussions with Mr R Simpson, an Officer of the local Government Board, held on 28 November 1911 (i.e. before the fire). Its purpose was to obtain a ruling from the Officer on the uses to which monies accumulated from Town Land rents could be legally put. Suggested uses were swimming pool, miniature rifle range, or fire appliance. A clear ruling was not forthcoming. Dr Fowler obviously became exasperated by this and wrote, “Of course the real point at issue was not settled, he (the local government Officer) wished to evade it, and it seemed to me undesirable to press it”. However the minds of the Council members were focussed by a sense of urgency generated by the catastrophic consequences of the fire. They unanimously agreed a motion that these monies be used for the purchase and maintenance of a fire appliance should be put to a parish meeting whose approval was apparently required for such an expenditure. It was also agreed that it would be put to this Parish meeting that monies remaining in the Coronation Fund should be added to the Fire Appliance fund. This Parish Meeting was quickly convened and took place on 4 January 1912. A lengthy discussion took place, but it was not reported in the next issue of the Beds Times as this came out on the following day, 5 January 1912. However, this issue did report that Mr C P Hall, on behalf of the Duke of Bedford had offered relief work for those unemployed as a result of the fire at “Kill Pits”, near the Agricultural Societies Farm in Husbome Crawley. 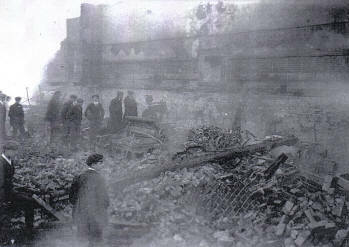 A report from the Fire Brigade was read to the Bletchley U D Council meeting on 9 January 1912. This report does not appear to have survived. The account for their services was approved, – hence a charge was made for the services of the Fire Brigade, but the amount is not known. However a Bletchley U D Council meeting on 27 February received a letter from the Fire Loss Assessors for the Powage Press suggesting a reduction to the Councils charge for the use of the steam fire appliance. The Council unanimously decided that this suggestion should not be entertained. The Beds Times of 19 January 1912 reported that the Relief Fund organisers were able to distribute 10 shillings to each man unemployed due to the fire. Also, those printers still in work were donating weekly sums to support the Fund. It also reported a meeting of the Powage Press employees on Monday 15 January 1912 Mr C. J. Minter presided and stated that the balance of £10 had been lost through the fire. About half was recovered, but so badly damaged that it was not worth its face value. It was agreed to restart contributions and officers to remain in post. They also set up a small sub committee, comprising Dr Fowler, Capt Coombe, Mr Wilkinson, Mr Miles, Mr Ellis, and with Mr Fryer as clerk, to draft a scheme for a Fire Brigade and report back to the next council meeting. On Friday 23 February 1912 the Beds Times reported a meeting of the Coronation committee. Apparently a sub committee thereof had been set up to organise a permanent memorial to the Coronation. They met afterwards and found that they had £35 in hand, which they agreed should be given to the Fire Appliance Committee, instead of having a memorial. Aspley Guise Parish Council received a letter to this effect from a Miss Burrows, Hon. Sec. Coronation Committee, on 26 February 1912. This Council meeting also discussed membership of the Fire Brigade Committee. Dr. Fowler explained that it would be made up of two members from the council, two representing the subscribers and one from the joint committee of the RDC. The Council appointed Mr W. Ellis and Mr S. G. Wilkinson as their representatives. A “very hearty” vote of thanks was unanimously accorded to the Fire Brigade Committee for the prompt manner in which they had carried out their work. Figure 8 shows a photograph of the fire appliance. It comprised a hand drawn, motor driven pump and hoses. It also shows eleven firemen, resplendent in the old style helmet and uniform, one, second from the right, probably the Captain. Five elegant gentlemen are at the front. They are probably the committee. It appears that there may have been two committees, the earlier one set up by the Council on 22 January 1912 to report on how it could all be done, and a second discussed on 26 February 1912 which may have had outside (RDC) involvement. Nonetheless in view of the limited number of people usually willing to be active in such affairs, it is likely that many, if not all, were on both. Therefore these five elegant gentlemen are probably Dr Fowler, Capt Coornbe, Mr Wilkinson, Mr Miles and Mr Ellis, but none have, so far, been positively identified. The appliance was housed in a wooden shed behind the Parish Hall, and remained in service for many years. 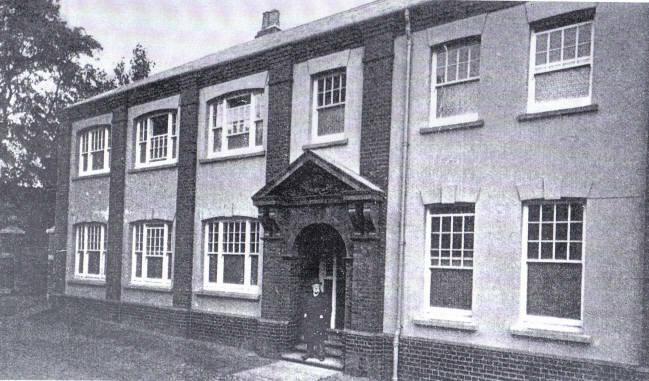 Design of the replacement premises started almost immediately and was completed by W B Stonebridge Architect and Surveyor, of Woburn Sands and Bedford by 18 March 1912, just three months after the fire. The contract for rebuilding was placed with C. Sinfield and Sons, builders of Aspley Guise, on 13 March 1912. The contract price was £2563-0s-0d with £85-12s-0d extras and savings of £57-1-9d, giving a final cost of £2563-10s-3d (approx £200,000 at 2011 prices). An article in the “The Stationer, Printer and Fancy Trades Register” of September 1912 was reprinted by the Powage Press into a booklet, one copy of which survives. The article is dated September 1912. The text refers to the photographs therein, and hence confirms their date also for September 1912. These include photographs of the interior of the new building with machinery installed and staff working. This means that the Powage Press was reopened and operational by September 1912, within 10 months of the disastrous fire. A stone over the front door of the offices facing the road is embossed with the date “1912”. Fig. 7. Photograph of the front of the new building in 1912, taken from a brochure. Mr Charles Minter is standing in the doorway. The fire had a significant effect on the entire community. Clearly it affected the 60 or so employees, many no doubt fearing for their livelihoods. It must have been particularly worrying for Grandfather George Parkins and his family. Only six months previously he had uprooted his family, in moving from Bedford to Aspley Guise, in those days a massive upheaval, then, to face this fire and the risk to the future of his job. But the community joined together to provide support for those out of work,- there was much less by way of state benefits in 1912 than today. Powage Press management acted quickly to keep the business functioning and continued to provide employment for some of the men. The premises were rebuilt, and the business restored all within 10 months, an achievement that would be remarkable even today. 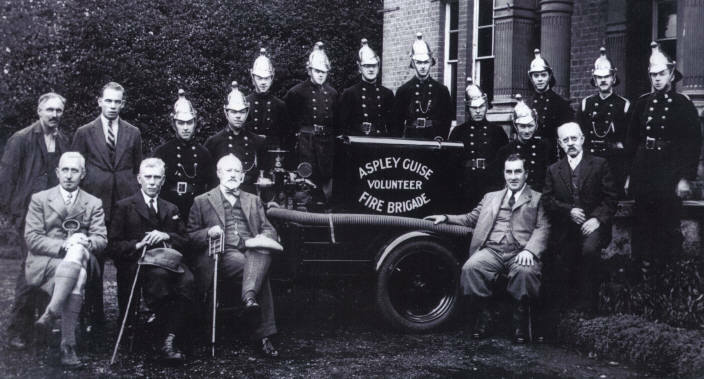 On the positive side the Aspley Guise community acquired a Fire Brigade with modern equipment, where none had previously existed. Powage Press had state of the art machinery in a modern building which continued as a printing works for the next 91 years. In the short term – a few months – this fire was a disastrous event which must have caused distress to many people. It brought out the neighbourly spirit, and in the longer term provided significant benefits to the entire community.